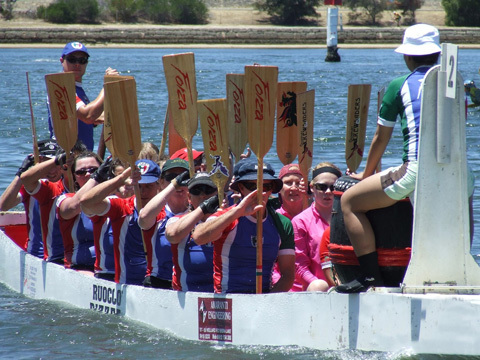 The Forza Dragon Boat Club try to preserve the traditions of dragon boating by carrying out their own version of the “Dotting of the Eye Ceremony” for all the racing boats at the Forza Dragon Boat Festivals and Regattas. Speeches are made by prominant people who dot the eyes, forhead and tongue then sprinkle holy water and throw rice, whilst the teams gather around the boats banging the drum and beating their hands against the inside of the boat. Read on below for more about the traditions of the Dotting of the Eye and Boat Naming ceremonies. Below, with thanks to “Dragon Boat World International”, is a description of the traditional ceremonies which was published in one of their magazine editions., Issue #1 January 2008. The modern sport of dragon boat racing was born in Hong Kong and many people still consider Hong Kong as a dragon boat “mecca”. Since I (the author) live in Hong Kong, I am frequenlty asked about how the traditional Eye Dotting Ceremony is performed. In Hong Kong there are two major ceremonies involving boats. One is the Eye Dotting or Awakening Ceremony and the other is the Naming of a new boat, which some people consider to be the christening. In Hong Kong, if you want to know anything about the tradtions of the sport you look to the Fishermen. The Fishermen, who populate the various harbours around Hong Kong, are the keepers of the traditions of the sport. In Asian culture the ceremony is about respecting the dragon and getting him into a good and friendly mood towards you, the team, and the community. You want the dragon’s protection, not his anger. However, additional ceremonial performances, such as the Lion Dance, are always welcome and definetely will add to a spectacular show and event. 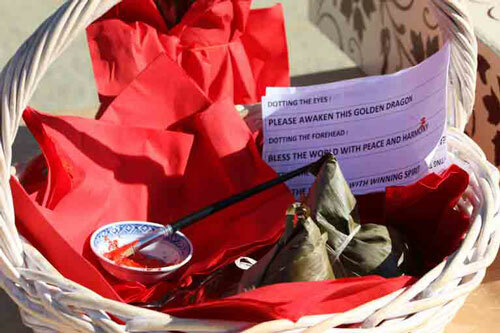 The ceremony which is known as the “Eye Dotting”, is actually the “Awakening of the Dragon” and should be repeated each year after the dragon’s rest during the off-season. It is typically performed when the dragon boats are first returned to service and again just prior to racing. It is important to remember that it is considered very bad luck to paddle or race in a dragon boat that has not been properly awakened or has its eyes closed. In Hong Kong the fishermen don’t incorporate the naming of a new boat during the Awakening Ceremony. Although naming the boat may be important in Western Culture, it is not such an important part of owning a dragon boat in the East. There is no smashing a bottle of Champagne against the hull or sprinkling of holy water. When planning the ceremony the first thing you want to do is set the date. You will need to consult a Chinese calendar as there are good and bad dates. A boat awakened on the wrong day will have bad luck and will not perform well. Choose wisely. There are several web sites that can help you find the right date or you can consult with a Feng Shui Master. In the case of Name Giving, paint the name on both sides of the hull somewhere close to the drum.Â When the paint is dry, cover it with the red wrapping paper or cloth. Before the ceremony you need to dress the boat by attaching the dragon head and tail, drum and drum seat. You should also decorate it a little. The boat can be on land or in the water for the ceremony. If the boat is on a trailer, make sure there is nothing in the way of the head and that it can be reached easily. If the boat is in the water tie it up at a 90 degree angle to the dock or to the shore with the dragon looking towards you.Â Remember you must be able to reach the eyes. It is acceptable to tie several boats together as long as they all face the same direction. Place the table cloth in front of the Dragon. If you don’t have a table you can put the table cloth on the ground in front of the boat. Put the fruits and chicken and perhaps other foods on the table cloth and decorate it nicely together with some incense. Place the metal bucket or container nearby the table cloth. Next, have someone who is important to the team, club or organization, like the team captain, club president or your big sponsors, hold the burning incense in their hands. The hands should be clasped together in front. The person should then bow three times to the Dragon and three times to the open water. The team and other attending guests may also bow. Repeat for each boat you are awakening. After bowing, place the Hell Money in the metal bucket and burn it. So far no speeches areÂ held. By making the sacrific and bowing, you will be showing respect to the Dragon and the Spirits of the Water. Again, have someone important to your team or group perform this step. If you are adding a sponsor’s name to the boat this would be a perfect time to involve them. Have the sponosr remove the wrapping paper or cloth covering the name of the boat. It is appropriate for the person to say a few words such as “this boat shall from now on carry the name……” or “I wish you all good luck on the water”… something like that. This is not the time for long drawn out speeches. Remember, the Dragon is waiting and he still can’t see. Again, one of the important persons, it doesn’t need to be always the same, takes the red paint and the brush and dots the dragon head at five points. The center of each eye, the tongue and the tip of each dragon horn. Painting the eyes gives the dragon sight. Painting the tongue gives him taste. The horns are painted to give the dragon power. If at this point the boat is still on land, it is time to launch it. You can place incense somewhere near the bow of the boat, the point where the head attaches is a good place. Once the boat is in the water have the crew load. The entire crew including drummer and helm back paddles some distance away from the shore or dock and then sprints forward briefly toward the ceremonial party. They stop the boat and repeat the process a total of three times. This symbolises the Dragon bowing to the audience, which many bow also or greet him in return. Next the boat is paddled once around the water venue. This allows the Dragon and the Spirits of the Water to become introduced and know where the Dragon will be moving around. When the boat is back to the shore, it is time for speeches and to cut the roast pig, which is known as good for the Gods. The cutting is ceremonial, but after that it just becomes another dish for the party. The fruits and chicken, which have been symbolically sacrified are in fact there and can be eaten. Again, there are many different variations of this ceremony. This is the one that many of the Hong Kong Fishermen use and that is familiar to me (the author). It is similar to ceremonies in other parts of Asia. If you use this one you can feel confident that your boats are properly awakened, named and are ready to race. Read about the history of dragon boating – links below. If you click on the link, and go to the “Downloads” page, you can download a “free” pdf version of Issue # 1 January 2008 – there are some interesting articles about the history and traditions of the sport as well as spotlights on dragon boating in other countries. Check out p9-13 Dragon boat racing in Hong Kong, p26 The Dotting of the Eye and Boat Name Ceremonies. You can also download from this page the IDBF Newsletter January 2009 (International Dragon Boat Federation). There are some interesting articles, including one about a dragon boat festival in a village in China. Also a calendar of events from around the world, the start of dragon boating in Brazil, the “Buy a Boat for Africa” campaign, and a tribute to the central figure in Australian dragon boating, Jon Taylor, who died in December 2008.